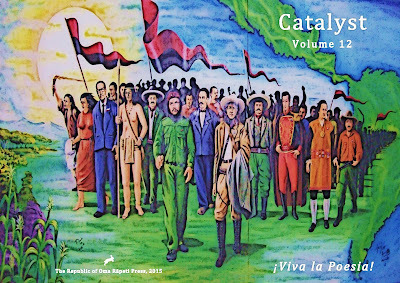 Catalyst 12 - Viva la Poesia! Well, we're on the verge of launching our 12th volume of writing from around Aotearoa/New Zealand and the World. Twelve years of publishing new, emerging and established writing and eclectica from all over the place. This dozen years has seen us grow from a slim volume focused on emerging talent in our own region of Christchurch/Canterbury to a somewhat larger magazine of truly literary art from around the globe. We have published writing in translation from many languages and cultures, featured poet laureates as well as writers that have never seen print before. Catalyst has also published visual art from emerging artists in New Zealand and worldwide - everything from taxidermy to stamp-collecting to political graphic design and graffiti. 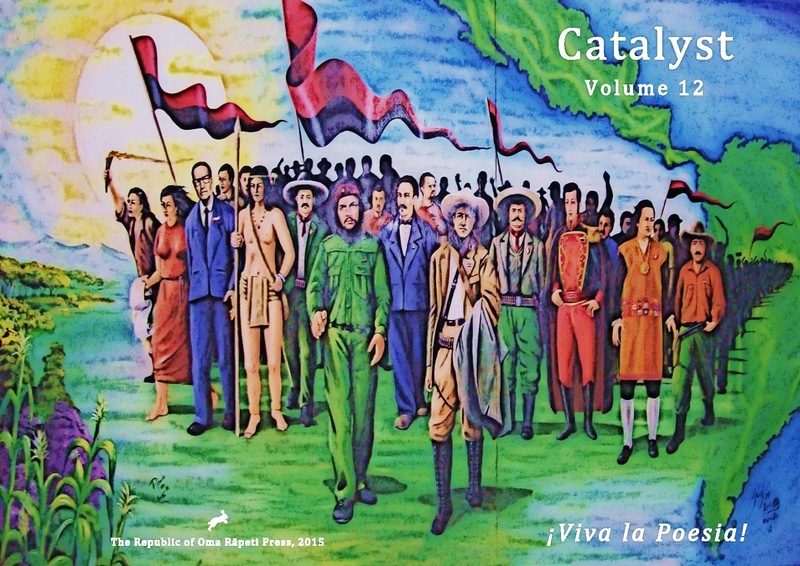 Catalyst also became the first literary magazine in New Zealand to regularly publish CDs of spoken word poetry and music. To date we have released three volumes on CD featuring the work of original NZ songwriters and poets fused together in interesting ways by producer Jody Lloyd aka Trillion. Along the way we doggedly promoted and encouraged a renaissance in performance poetry, poetry slams and avant garde poetry theatre and music-related performance. Catalyst continues to host the longest continually running poetry open mic in NZ. (For more on our history see the 'Tell Me More' tab above). To whet your appetite before the big launch of Volume 12 this coming week, we re-print here excerpts from the editorial by Publisher/Editor Doc Drumheller. Enjoy! In February 2015, I had the privilege to participate in the eleventh edition of the Festival Internacional de Poesía de Granada. Once again Nicaragua hosted one of the most extraordinary celebrations of poetry in the Americas. Since 2005, the International Poetry Festival of Granada has brought together poets from more than one hundred countries all over the world. Poets spend a week in Granada, a colonial city, one of the first to be established in the Americas by the Spaniards (1524). They participate in readings attended by thousands of people, get to meet other poets, and enjoy Nicaraguans’ love of poetry, which is quite a joy to behold and experience. It is essential for poets from New Zealand to be able to participate in festivals like the one in Nicaragua, because Latin America celebrates poetry like nowhere else in the world. The poetry readings took place in a number of scenarios: atriums of churches, public squares, colonial buildings, markets, universities, police stations and in neighbouring small towns. One of the highlights was the poetic carnival, where all of the poets were on parade and took turns reading at each street corner on the back of a decorated horse float. We marched and shuffled to the rhythm of the music through the closed roads of Granada, all the way to the the famous lake, where we were treated to a performance by numerous cultural, dance and musical groups, all dressed in traditional folkloric costumes. The festival is the most important cultural event in Nicaragua and is widely covered by national and international press. Each year the Festival honours the work and legacy of a Nicaraguan poet, in its XI edition, the Festival honouredthe poet: Enrique FernándezMorales, and in memoriam of the Costa Rican poet, Eunice Odio. The feature poet for the festival and for this issue of Catalyst is Richard Blanco. Richard Blanco is the fifth inaugural poet in US history—the youngest, first Latino, immigrant, and gay person to serve in such a role. Born in Madrid to Cuban-exiled parents and raised in Miami, the negotiation of cultural identity and place characterise his body of work. I am delighted to be able to collaborate with Roger Hickin from Cold Hub Press to present a feature of Nicaraguan poetry. Each of the poets were at the festival and the work first appeared in chapbooks published by Cold Hub Press with translations by Roger Hickin. Also featured in this issue are the Lyttelton Poets, all of whom are no strangers to the pages of Catalyst, nor to our open mic and Road Show series, appearing in various guises and line ups over the past decade. Earlier this year the Republic of Oma Rāpeti Press published Andy Coyle’s book Ode to the Cyclist and other poems. Another feature in Catalyst 12 - ‘Lady Poets’ is a regular live Poetry event created and run by Cantabrian performance poet Kimberley Holmes. Beginning in 2013, based in Christchurch and using local venues, ‘Lady Poets’ has carved a space to thrive in its first two years. With a uniquely subversive vision and tongue planted firmly in cheek, ‘Lady Poets’ aims to provide an inviting and encouraging space for female and marginalized writers to share their creativity. Utilising New Zealand and international talents, ‘Lady Poets’ offers a stage to voices often unheard, proudly appearing twice in Christchurch’s annual Pride Week celebrating queer poets. Experimental and engaging, ridiculous and comedic, by testing the limits of audience and poets alike ‘Lady Poets’ has been embraced for its theatrical and empowering poetry events. I was spoiled by so much good work for this issue and it was difficult to decide which poems to leave out. Thanks to Creative Communities Christchurch for their continued support of this journal, as we continue to publish some of the world’s leading poets alongside Canterbury’s new and emerging voices.